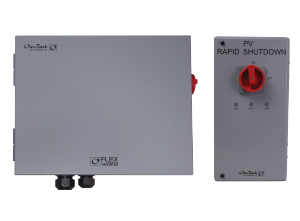 The FLEXware ICS Plus is rated to 600VDC for integration in a wide range of systems and designed for ease of service and clean wire management. Packaged systems include easy-to-order, complete solutions for battery-based systems requiring one, two or four combiner boxes, while individual components can be ordered for alternative system needs, including use with grid-direct PV inverters. When used with OutBack power conversion and energy storage components, the system will represent the only single-brand UL and NEC-compliant solution from rooftop to battery.